I haven't talked about this on the blog much because it wasn't public information at work (and various people from work read my blog) and I've been hemming and hawing over the decision for the past, oh, year, but it's true, public, and I'm ready to share. If you don't already know, Ben was accepted to medical school (yay, Ben! ), and will be attending in August this year. That means we'll need to pack everything up in a big old, clunky, terrible, unreliable U-Haul and move to the city of roses: Portland, Oregon. I'm going to be all alone while Ben doesn't eat, sleep, or talk in full sentences, so I am going to have to trust all the Portlandians out there to give me recommendations of places to find great deals on clothes, great places to eat (and drink), and spots where I can take my outfit photos all by my lonesome without fear of being kidnapped by the dream of the nineties. Hooray! I'm happy that I can finally share this giant life change with you all. This boring spending freeze has, though, led to some awesome remixed closet items like this pleated skirt plus striped dress from the Gap look. I really love finding a workable new alternative to wearing something an old way. I've worn this skirt countless times and always seem to find something new to do with it. All hail the pink pleated skirt. Please stop by The Polished Monkey where I'm giving away ad space with some other awesome bloggers, and The Tiny Heart, Sharon's lovely blog where I'm also giving away some ad space in her monthly giveaway! Linking up with Style Sessions. I hope you will enjoy your time in Oregon! I love visiting that area. Great skirt! Ooh, hope you have a fab time away! <3 And your skirt is GORGEOUS! The blush shade looks beautiful with your skin tone! Beautiful outfit... so simple but cute! Congratulations! I hear Portland is amazing! And I adore your skirt! That skirt is SO pretty, love it with the stripes! Oh yes paying off one's credit card is a good thing! Did you change the design of your blog it looks good! 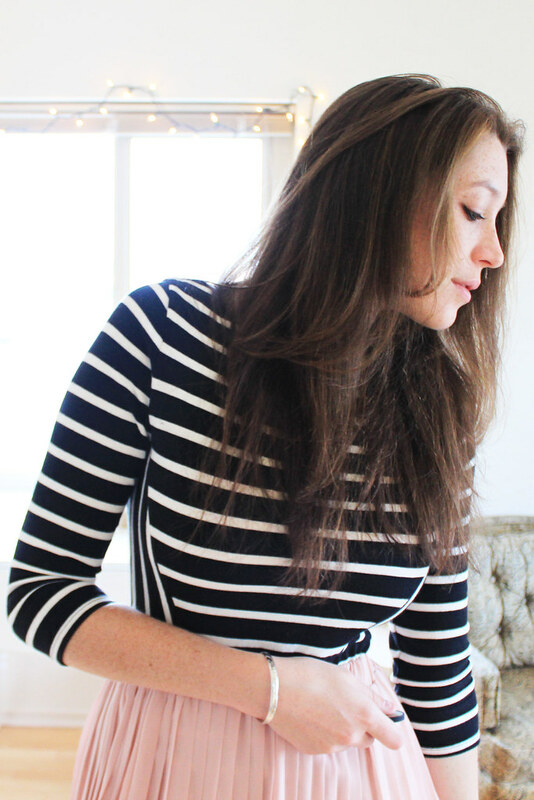 Love this twist on nautical. It looks amazing on you. Cutest skirt! And loveliest outfit! Love the pale pink skirt! Congrats on the big move! wow!! congrats!! i need to go on a spending freeze too... just cuz hahah!! Moving house can be stressful but I am sure you'll have it all sorted out. I told my husband the next time we move it would be when we retire, LOL! Loving the skirt! I am with you on dreading moving. I will also be moving and I could not dread it more! Ugh, I will have to email you so we can discuss moving woes! Hello! Just found your blog and it's so cute! Love your style! I'm wearing a very similar skirt-outfit on my blog today! Haha. Hope moving details all come together! I know that can be stressful! I love your skirt! And I'm sure Portland will be great. I love this pairing, your skirt is so adorable!! This outfit. SO.PERFECT. 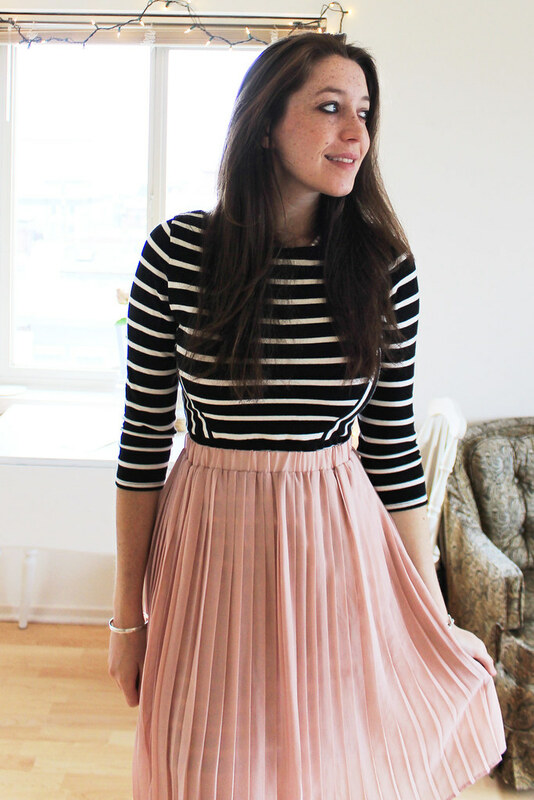 I love the pleated skirt, and you styled it perfectly with the striped top and black flats. Gorgeous! WOW GREAT POST:)you look AMAZING. I love outfits using repurposed items! This is a great one. Btw, I found your blog and IFB (technically you found me, you were my very first welcome to the site, so thanks for your kindness! ), and I'm really loving it! 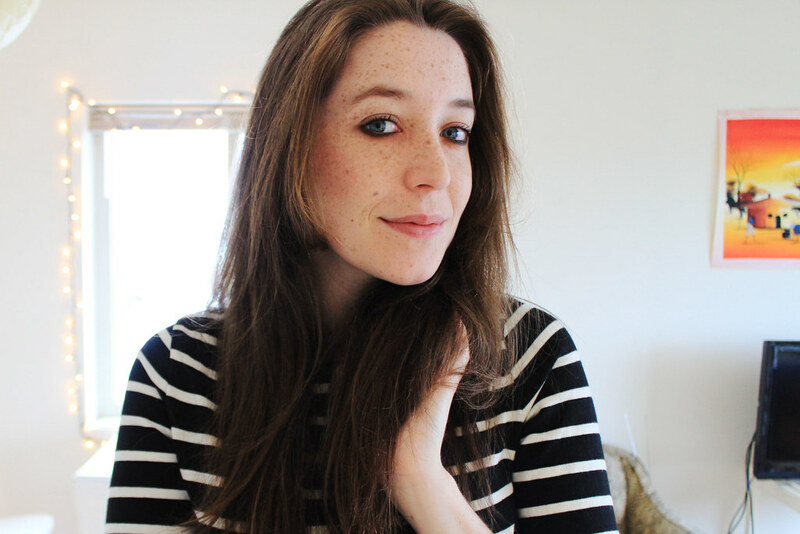 I'll be keeping up with you now thru bloglovin. I'm just a little confused about the blog's name "ladies in navy", why the "ladies" in plural? It seems like you are the only one blogging here. Congratulations to Ben! And that's so exciting that you are moving!!! I love your outfit and the fact that you made the dress into a top! Gorg! Congratulations on the move! That's awesome! That skirt is so pretty! Congrats to Ben for being accepted into med school! That is great news! I wish you the best with the move! Love this gorgeous skirt, and good luck with the move! these pictures are so gorgeous. your house looks so cute. Well Congrats to Ben! I've only been to Portland once but it's amazing. I just love that city. You will have so many wonderful places to take photos on the seawall! I'm so excited that you're moving to Oregon. We'll have to do lunch or something when you're all settled in!!! Love this Parisian look. The skirt is absolutely beautiful! Super cute look. The skirt is cute. I'm loving pleats right now.